As we head into the Holiday season and all around me I am reading about familiar Thanksgiving dishes I can’t help but think of all that heavy food: All those post dinner naps in front of the television, all that heartburn and uncomfortable ‘I’ve eaten too much’ feeling. And don’t get me started on the jeans that no longer do up or the need for loose fitting clothes to hide all those moments on the lips that last a lifetime on the hips. I have the solution – a light and tasty meal that cooks up in no time at all, for between the over indulgence at the holiday table – shrimp. I keep a couple of bags of frozen shrimp in the freezer – I like the tail on wild shrimp from Trader Joes for the sweeter flavor and firmer texture and I avoid anything that says farm raised. The best way to thaw the frozen shrimp is overnight in the refrigerator. However, if you are like me and that sounds like much to much advanced planning you can quickly defrost by placing the bag under cold running water from the faucet. As well as the recipe for a simple stir fry below you can also cook up some shrimp sans veggies using the marinade and sauce and serve it over lettuce and cucumber for an even lighter lunch. Snap peas can be substituted for the baby bok choy, sometimes I will add a small onion and any bell pepper can be used – but I like the orange for color. In fact get creative and use whatever crisp veggies you have – carrots, bean sprouts – even Brussel’s sprouts shredded have been known to go into the wok. 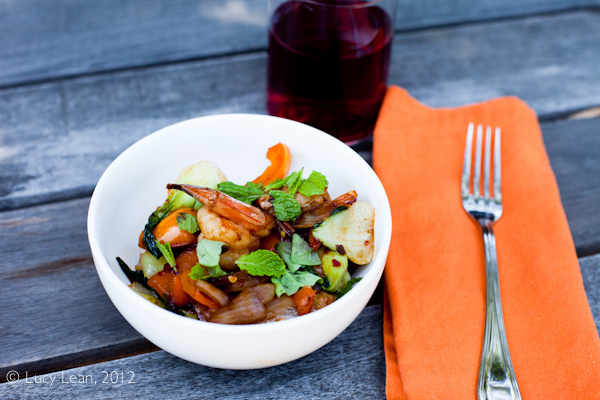 The key to this recipe, and to stir frying shrimp in general, is to marinate the shrimp for 30 minutes before stir frying. 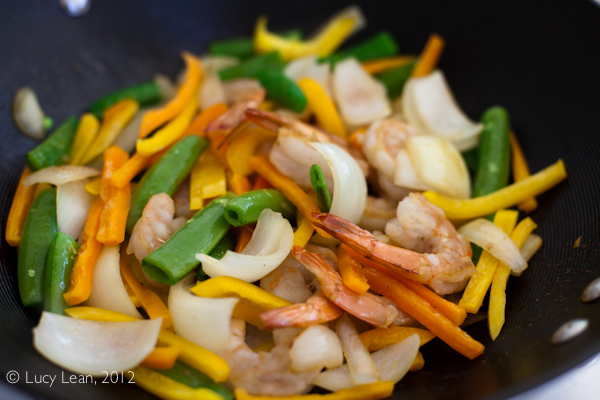 It’s also best to stir-fry the vegetables separately from the shrimp – this will avoid the shrimp over cooking and becoming rubbery. fresh herbs to garnish (I like lots of mint and basil (preferably Thai). 1. Combine minced garlic with shrimp, ginger, 1 tablespoon canola oil, and salt in medium bowl. Cover and marinate at room temperature for 30 minutes. 2. Whisk the sweet soy sauce, sugar, honey, vinegar, Sambal, sesame oil,and ketchup in a small bowl. Combine sliced garlic with shallot in second small bowl. 3. 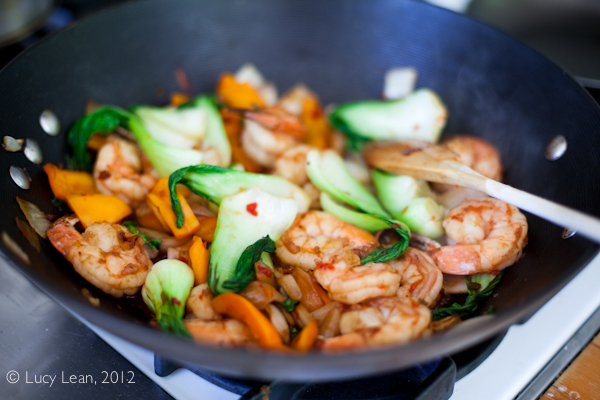 Heat 1 tablespoon coconut oil in a wok or non-stick skillet over high heat. 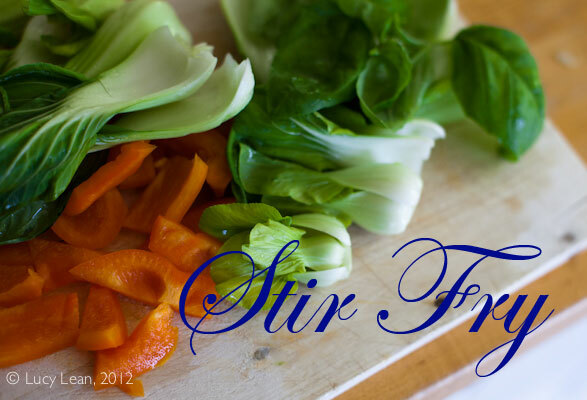 Add the baby bok choy and bell pepper and cook, stirring frequently, until vegetables begin to brown, 1½ to 2 minutes. Set vegetables aside in medium bowl. 4. Add remaining 1 tablespoon coconut oil to now-empty skillet and heat over high heat. Add garlic-shallot mixture and cook, stirring frequently, until just beginning to brown, about 30 seconds. 5. Reduce heat to medium-low and add marinated shrimp, and cook, stirring frequently, until shrimp are light pink on both sides, 1 to 1½ minutes. Whisk soy sauce mixture to recombine and add to skillet; return to high heat and cook, stirring constantly, until sauce reduces and the shrimp are cooked through, 1 to 2 minutes. Return vegetables to skillet, toss to combine, and serve immediately with lots of fresh herbs sprinkled on top. A nice, lite dish during the holidays. I love a good stir-fry!